Test Kitchen Tuesday | Healthy Eating and Healthy Living for a Happy Life! My how time flies when you’re pinching pennies. In a good way! Side Note: I am changing web hosts tomorrow, and my feed is changing. Please change your RSS subscription to this feed so we don’t lose each other! 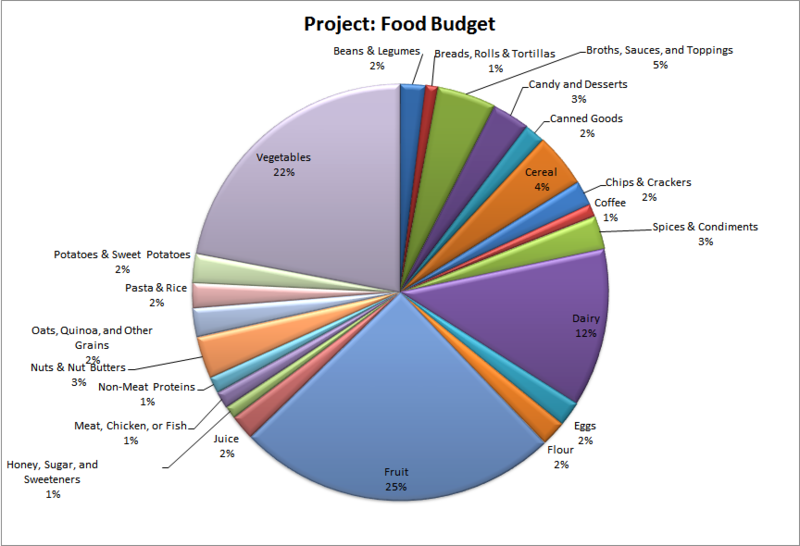 Before we get to this week’s report, I thought I’d share a little data of how we’ve faired after 3 months of conscious budgeting. Since this is kind of a small graph, I broke it down a little more in a chart below. To not skew the numbers, instead of counting fruit and vegetables at the individual level (e.g, number of bananas per purchase), I just counted each fruit and veggie acquisition as “1.” Otherwise, the data was very skewed to fruit – we bought 54 bananas in 3 months! As I was grouping items into categories, I really just made things up on the go. Here is the breakdown. 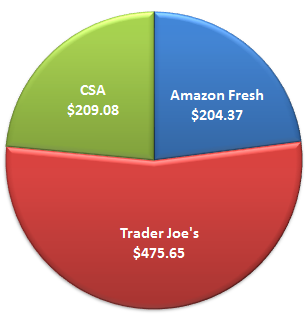 I’m happy to see that fruits and veggies make up more than half of our purchases. Most amusing to me is the high percentage in the “cereal” bucket, as, if I didn’t cook for him 2Chili would live on cereal and Trader Joe’s 12 Grain Crackers. I would say if I looked back in time a few months a much, much larger percentage of this breakdown would have gone to Amazon Fresh. It is just so much more convenient to shop online and have your groceries delivered to the doorstep. This project has been great for helping us reign in expenses and really determine if something is worth it or not. If I have wiggle room in the budget, I may splurge a bit (Hello Halibut! ), but I have been pretty true to buying only what we need. I haven’t sacrificed quality for cost, and we certainly haven’t gone hungry! 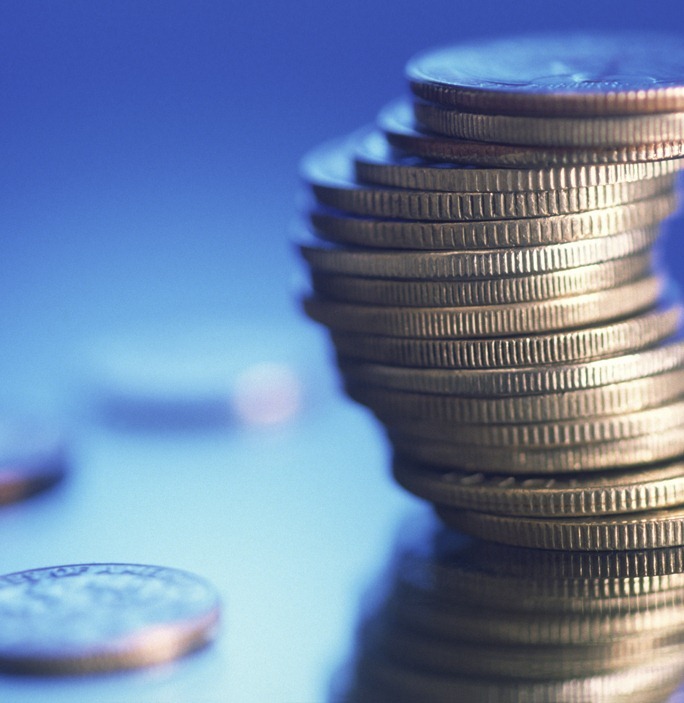 I think not really eating meat has helped in the budgeting – meat products are expensive (as they should be). Those darn highbrow chocolate chip cookies pushed me over the line. They were right at the check stand without a price tag (of course), and I caved! Oops! I could have made a lot of cookies from $3.99. I cannot wait to dive into the Rio Star Grapefruit. Texas Grapefruit are just so juicy and sweet – not bitter! First order of business – have you updated your RSS feed to follow my Feedburner feed? I am 99% sure I’m changing host servers on Friday night, so I want to make sure not to lose you! And, thanks to everyone that has updated their feed. You make me happy! Oftentimes, simple is best. I am learning that the best recipes – and most successful Test Kitchen Tuesdays – are those that revolve around very simple ideas and flavor combinations. So, when I stumbled upon this idea for Teriyaki Chickpeas over at The Happy Herbivore, I had a good feeling it would go over well with 2Chili. 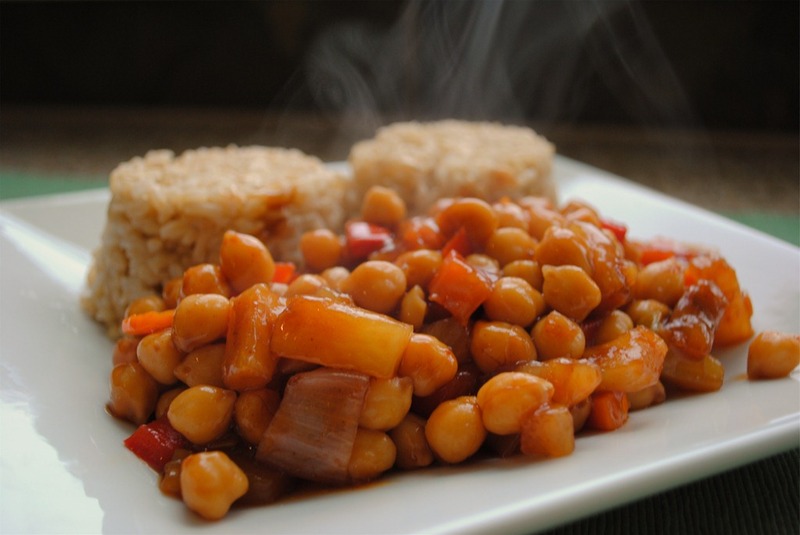 He likes chickpeas, and he loves teriyaki – there wasn’t much room to go wrong! Yeah, I’d say this was a hit. Time Required: 15 minutes, start-to-finish, assuming you’re using canned beans and quick rice. I used dried beans and long grain rice I made over the weekend. It is rare for 2Chili to take seconds of dinner – he’s conscientious about calories like me – but he had a full second serving of this dinner with brown rice. And he doesn’t “like” brown rice. This was awesome, plain and simple. And, took 15 minutes. Can’t beat that! For ¼ of recipe, without rice. The Verdict: Oh yeah, this will be in our rotation. Easy and tasty, and a 2Chili pleaser to boot! I have mentioned a few times that I wore a BodyMedia device last summer and really got a lot of value from it. I learned what I needed to know about my daily calorie expenditure versus consumption. So much so that after a few months, I sold the device on eBay and went about my life. But, as I have gotten deeper into training for my upcoming Half Ironman race, I started to miss the data I used to get from the BodyMedia. I wanted to know how many calories I was burning in a day, and I wanted to know how much I was really sleeping every night. I also want to lose about 10 pounds (nice idea, but probably not practical) before my big race. So, last month before we went on vacation to Utah, I hit up my peeps at Amazon Fresh the day before we left and had a new BodyMedia on my doorstep before dawn – just in time to take it skiing. Have I mentioned I love Amazon Fresh?! I have been wearing it pretty consistently since then, and have found out they have made some great improvements to the device since the version I previously used. I have found this little gadget so useful that I thought I’d write up a review about it and share what I’ve learned. 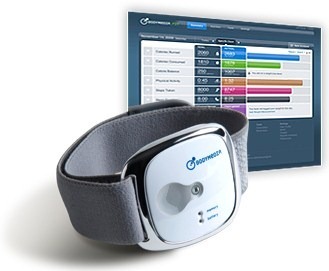 While the device is marketed primarily at those looking to lose weight, it can also be very helpful for endurance athletes who are concerned about maintaining weight and measuring sleep. I’ll go over the details of what you get and how to use it, as well as nuances and tips/tricks I have discovered from using it. The coolest thing about this updated version is that it now has Bluetooth and has an app for both iPhone and Android. I’ll get into these apps a little later on. You may have heard of the competitor to the BodyMedia, the BodyBugg, as this is the device that Biggest Loser contestants use. While the two are actually very similar, there are some differences – namely the ability to monitor sleep – that set the two apart. Here is a nice chart that compares the two based on functionality. Before you can use the device, you need to do a few things. First, you need to plug the monitor into your computer via the provided USB cable to let it charge. To do this, you just pop the white device out of the grey armband and connect it to your computer for about 3 hours. Second, you need to set up a BodyMedia account so that you can sync your data from the device. This is done at their website, www.bodymedia.com. 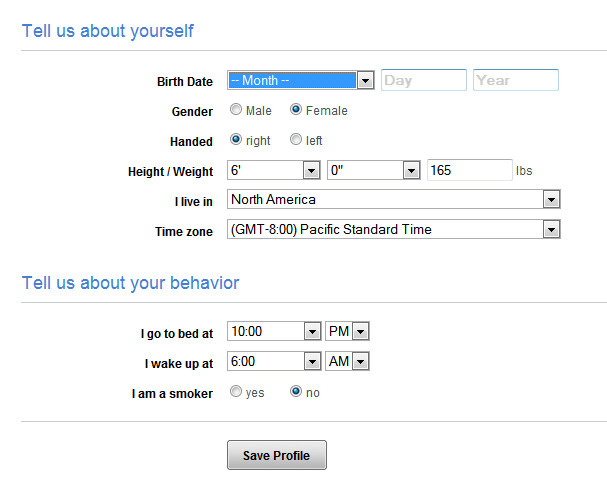 In this process, you enter some key statistics about yourself so the monitor can get a “starting point,” so to speak. Additionally, this account is where you will go to download and view data from your device. Third, once you have a BodyMedia account, you can download and set up the BodyMedia app for your iPhone or Android. I have an iPhone, so that’s what I’ll talk about in this review. Before you get started, you’ll want to set up some weight loss (or maintenance) goals so that the device can set up your “program,” or, what your daily calorie burn, step, calorie consumption, and activity goals will be to meet your weight goals. Here is my Goals page. You can see that I have set up a goal to lose one pound a week. 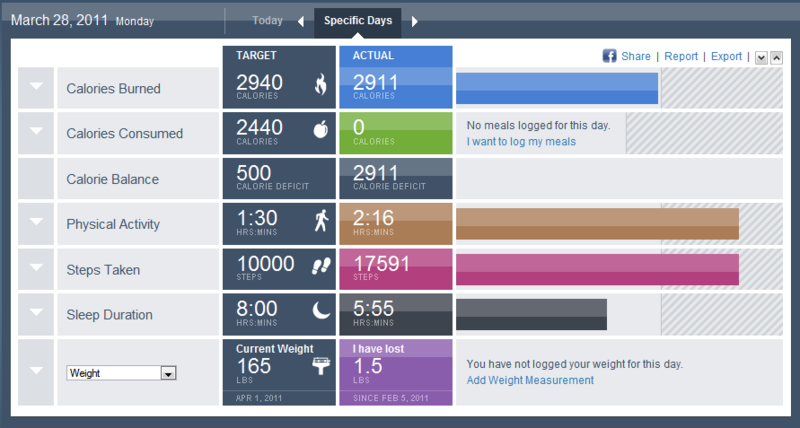 In order to do that based on my activity level, I need to burn 2940 calories a day and eat 2440. Sounds so simple. Ah, but it’s a challenge! I very rarely get both metrics exactly right in a day. A more practical person would set a lower burn and consumption rate, but, I am a goal chaser! Don’t worry if you think you’ll change your mind about your goals. You can go in and change these at any time. So, start with what you think you want to do (perhaps “Get Active”) and then adjust over time as your goals change. 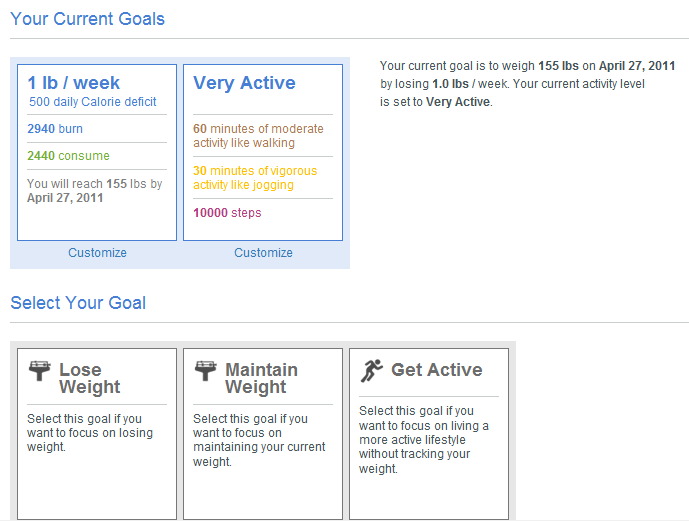 Once the monitor is fully charged and your goals are set up, you are ready to start tracking calories. You simply pop the monitor back into the armband and secure it around your left arm behind the triceps muscle and just go through your day as usual. There is no need to over tighten the armband – you want it secure but not super tight. If you over tighten, you’ll just end up with irritated skin (trust me). Calories Out. The BodyMedia takes care of this for you! With the BodyMedia, you get access to their own food logging system. I’ll be totally honest: I don’t use their food logging system. I find it cumbersome and slow. If you have never logged calories in any kind of app or website, you might find it okay, but there are so many better choices for this task. So, I use the Lose It! app on my iPhone for logging and don’t worry about inputting any calories into either the BodyMedia app or website. The one benefit to taking the time to set up your food logging in either the app or website is that you will see a visual comparison of your calories burned vs. calories consumed in your online and app dashboard. To me, the time saved by using Lose It! is worth it. I just keep a little Excel spreadsheet that I input calories eaten and calories burned in one week chunks. It works for me, but you may want to have everything in one place. This is the meat of the product, so I’ll try to cover as many aspects as possible. 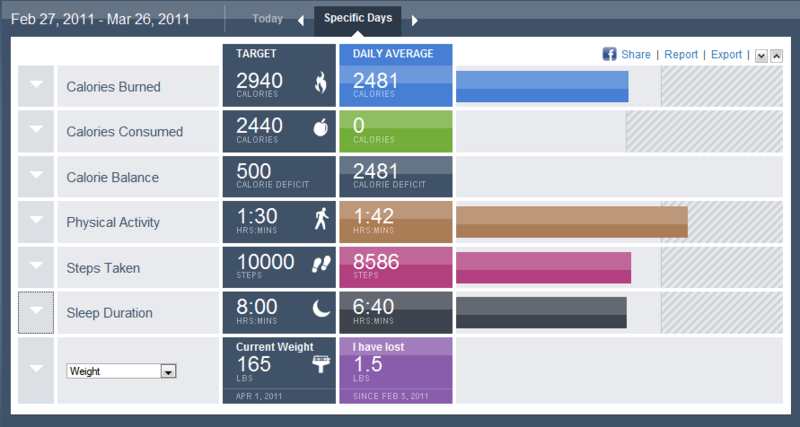 With your online BodyMedia Account, you get a dashboard that shows you what your body has been up to for the day. You can show information at a daily, weekly, or monthly level. Here is a snapshot of one of my days recently. Each little area is expandable, so while in your Dashboard you can drill down in a particular area to get more info. You’ll notice here that I don’t have any “Calories Consumed” because I don’t use their calorie logging feature. Here, I have drilled down on the calories burned section to show the detail you get by expanding the section. Notice that there is a grey slider just above the graph in this image. You can move that slider closer together or farther apart to get a calories burned snapshot for a certain time period. On this particular day, I ran on the treadmill for almost two hours between 4 and 6 p.m. 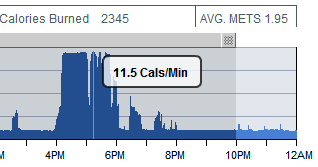 If I want to know how many calories that exercise burned, I just move the sliders closer together. From 4-6 p.m, I burned 1209 calories. Pretty cool to see, huh?! If you so desire, you can also see calories burned information down to the minute level by moving a little blue line across the data with your mouse. During the heart of this workout, I was burning 11.5 calories a minute. It should also be noted that eating was the last thing on my mind after this workout – it was a doozie! A second bit of data that I find valuable on the Dashboard is my sleep information. Here you can see that I am a fidgety sleeper. Some nights I do well, some nights I don’t. The BodyMedia tracks time laying down and time sleeping, and tells you your sleep efficiency percentage (ratio of laying down to sleeping) so you can see what is happening overnight. Apparently most adults have about an 80-90% sleep efficiency. I usually see about 83%, but this particular night I was up a lot for some reason. In order to see information on your Dashboard, you need to download data from your monitor. This involves removing the monitor from your arm and plugging it into your computer. You just snap the monitor out of the armband, plug it in via the mini USB cable, and you’ll see a little pop up that your data is now downloading to your account. The monitor can store 14 days worth of data before you need to download, but the battery only lasts about a week. So, at the very least, you should download once a week. I like to download every couple of days, but I want updates more frequently than that, and that’s where the iPhone/Android app comes in. 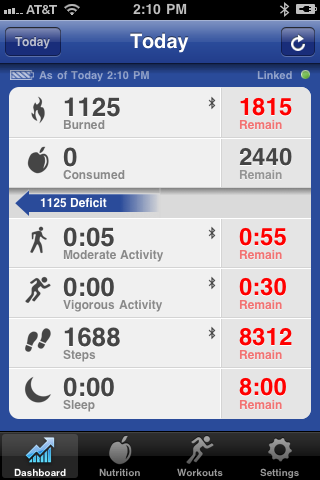 The app lets you take a snapshot of where you are throughout the day without removing the armband. To get real-time data via your phone, you do have to sync the monitor to the app, which requires depressing the little button in the middle of the monitor and waiting for the “boop-be-boop” noise. Translation: Don’t sync the monitor in a library. Or a church. Or, while waiting in line at the grocery store. Or, do. But, don’t be surprised when people look at you weird because your arm is beeping! Here is a mid-day snapshot from a day when I was seriously slacking. (Okay, it was a rest day, but, you can see, I didn’t do much.) In this image, you can see the battery level on my monitor (the little battery image in the top left), as well as key stats about my day. Calories burned, activity, and steps are all transmitted via Bluetooth. For some reason, sleep does not sync via Bluetooth. It will remain at 0:00 until I sync the monitor with the online app, at which point, it will update. I have seen some folks complain that the syncing doesn’t always work, but honestly, I have had about a 98% sync success rate with the app. I can only remember one or two times where I couldn’t sync when I wanted to, and when I tried again later it worked fine. I have also used the app real-time while running on the treadmill. I just prop it up onto the little shelf, sync it, and start running. Then, I see calories burned and steps taken updates throughout my workout. It seems to refresh data about once every minute. There is a lag, but it is not significant. Like the online Activity Manager, the iPhone app has the capability to do food logging. Also like the online version, the food logging is slow and cumbersome. I just don’t use it. I used it for one day and wanted to pull out my hair. But, if you use the logging feature, you will see your real time deficit or overage information between the top and bottom sections of this screen. In general, I find the iPhone app a huge improvement over the very plasticky “watch” device that you used to have to use to get real-time updates. It’s convenient, free, and works well enough for my needs. I would love to see some sort of integration with other calorie tracking apps so that you could just sync up your data across apps and not have to input calories into the BodyMedia app specifically. Calorie counting is definitely not their forte, so it would be nice to see them farm that out to a company that does specialize in making counting calories easy. For those looking to monitor trends over time, the online Activity Manager allows for snapshots of your daily stats over a 7 day, 14 day, 21 day, or 28 day period. This deeper look is pretty interesting to see how you are doing over a more macro instead of micro level. Here we can see that from February 27-March 26, I burned almost 2500 calories a day, walked about 8500 steps a day, and slept an average of 6:40 per night. Interesting data, I think, but I am an admitted geek and enjoy this sort of analysis. There may be times when you do an activity but don’t wear the device. For me, this is when I go swimming, as the monitor is not waterproof. But, never fear! You have the opportunity to manually input activities in your Activity Manager through the “Edit Off-Body” screen. You simply click “Edit Off-Body,” an a pop up window appears. From this screen, you see the times when you weren’t wearing the monitor, and can select what you were doing during that time from a list of activities. 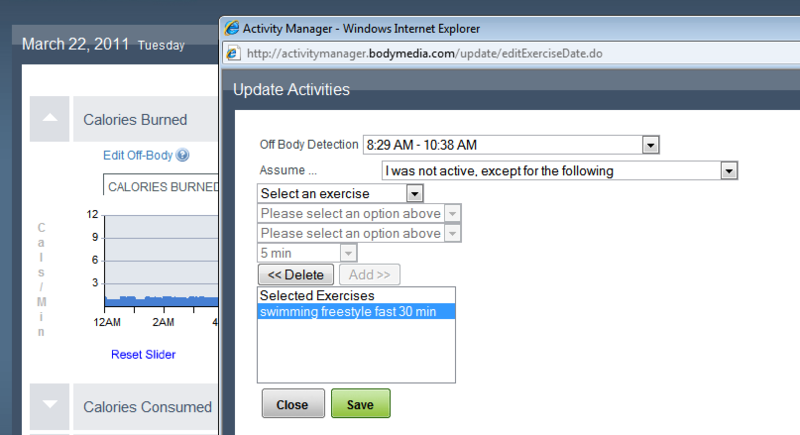 In this case, I was swimming, so, I have selected swimming and my speed, and then I click “Save” to save the activity to my Dashboard. You’ll notice that the manually-edited activity time is much more rigid looking than naturally-occurring activity. I now have a solid block of time between 8:30-9:30 a.m. which reflects my swimming time. Note: I have noticed when I do a manual off-body edit and then sync my iPhone app that the edits do not appear in the app. The Bluetooth connection to the monitor appears to override the online edits. This is not a big deal to me, but, you should keep it in mind. Hopefully BodyMedia will fix this glitch in future updates to the app. I could continue to deep dive into every screen available in the Activity Manager, but I think you sort of get the picture that you can get a lot of data out of this tiny little device. So, let’s talk about pros and cons. Highly accurate. I have found the device to be really very accurate, with the possible exception of biking. I have read a lot on this topic, and other folks appear to agree that it underestimates calories burned during biking and spinning. In general though, if I calculate out my Basal Metabolic Rate, and then add in the various activities I do throughout a day, I find that the monitor is very close to that projected number. But, I don’t have to do a bunch of math every day – I just let the monitor tell me what I’ve done! Easy to use. Really, the device is pretty simple. There is one button on it that you press to sync with your phone. Otherwise, you just wear it. Easy to clean. I wipe down the sensors on the back of the unit every day with a cotton ball with a bit of rubbing alcohol on it. That’s it. Highly motivating. When you look at your progress throughout the day, seeing real numbers is amazingly motivating. I have been known to grab the dog and go for a walk – even if I’ve had a workout already – to meet my daily step or calorie burn goal. It’s like having a live-in trainer tell you what to do, without all the yelling. Ongoing cost of ownership. In order to download your data, you need a BodyMedia subscription. It’s free for the first three months, but after that, it’s anywhere from $6.95-$9.95 per month, depending on how long you commit. Potential for skin irritation. I haven’t had this problem since I figured out not to over-tighten the device, but if you have sensitive skin, you could experience skin irritation from the metal sensors. The keys here are to move the device around (i.e., don’t put it in the exact same spot every day), keep it clean, and, make sure not to put the armband on too tight. Weak calorie (input) tracking capabilities. I’d say the “calories in” tracking aspect of the whole package is the weak link. If BodyMedia wants to really improve their offering, they’ll get their act together on the tracking aspect. 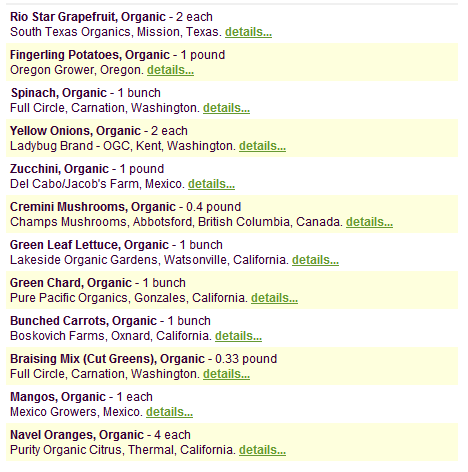 Page load times need to be improved and the food database needs to be dramatically expanded. For now, using a non-integrated calorie tracking app or website is your best bet to avoid frustration. Notice-ability. Personally, I don’t care about this. But, if you wear a lot of sleeveless or tight-fitting shirts, people may notice this monitor on your arm. Be prepared to explain what it is (people are fascinated – I have explained it a lot) or cover it up! Overall, I think this device is pretty darn amazing, especially for something that only runs about $220 US. It uses a lot of different inputs received from your body to do a pretty good job of telling you what you do in a day. It may not be 100% accurate, but it is definitely accurate within a small tolerance. When the data from BodyMedia and my food tracking shows at least a 3500 calorie deficit over a period of time, I can back that up on the scale with weight lost. It is just that simple. I am a data-driven person, so I like to see in real numbers what is happening. This also helps me not get down on myself. I know if I don’t have the numbers to back up weight loss, I shouldn’t be upset about not losing weight. It helps keep me rational! I think folks that are looking to lose weight and not succeeding could find a lot of benefit out of this device. Weight loss comes down to math, pure and simple, and this device tells you in no uncertain terms if you are really on a path to lose weight. It also doesn’t lie or sugarcoat anything – it tells you what you are really burning, not what you “think” you are burning. It is human nature to overestimate energy expenditure and underestimate food consumption, but as long as you consistently wear this device, there will be no need for estimation. They say knowledge is power. This device gives you all the knowledge you need to succeed in weight loss. It takes the guesswork out of the “how many calories do I need?” equation, and leaves you to do the real work – eating right and exercising to hit your numbers. Times, they are a’changing. But, for the sake of making an important point, I’ll cut to the chase: RSS Friends, please take a second and update your feed reader to follow this feed: http://feeds.feedburner.com/TestKitchenTuesday. I recently got with the picture and learned what Feedburner is and why it is important: Mainly, that I can change hosts over time and not lose you. I keep waffling back and forth on potentially changing hosts, and, I don’t want to lose you if I do! We have become so close, yet we’re so far away. And, if you stopped by on Friday evening and noticed something different…or perhaps nothing at all…I apologize. I was doing a little behind-the-scenes tweaking and experienced a little downtime. I should have better things to do on a Friday night! Today, I have a tasty recipe for you. I just adore cinnamon raisin bread, but, store bought can be kind of dry in my opinion. And, the slices are always so small. Why are the slices so small? If anyone knows, I would love to be enlightened. 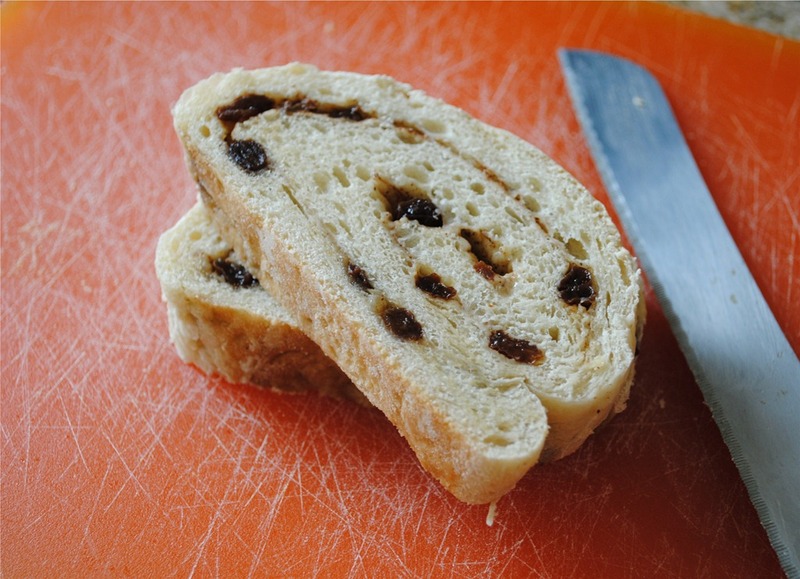 Here is a cinnamon raisin bread that is based on 2Chili’s favorite bread. When I made it the first time, 2Chili proclaimed, “This is GOOD bread,” without being asked. That’s how I know something is truly good – if I get positive feedback without prompting. Coming from someone whose nickname is “2ChiliBreadBowl,” I take feedback on bread very seriously. The man is a bread connoisseur. The first go round, I made it in a bread pan so it had more of a traditional loaf shape. This time, I made it as more of a French bread shape because it got a little too big for the loaf pan. Either method works fine, and they both taste great! Preheat the oven to 350 F when the dough is done and put it on a lightly floured surface. While the oven is preheating, roll the dough out flat and spread the brown sugar, raisins, and cinnamon (if you choose) evenly over the dough. Roll the tough tightly into a roll – much like you are rolling a cinnamon roll. It should be very tightly rolled! You can either transfer into a bread pan and allow to rise while the oven preheats or bake in more of a French loaf as it is after being rolled. Do you have big plans for this weekend, which promises to offer the first glimpse of impending Spring? We certainly do. I’m making waffles right now (multitasking at its finest) and later we’re off to tackle a 40 mile bike ride. Then, it’s time to cut our grass, which is beginning to look more and more unkempt and overgrown. It’s probably still too wet to really mow, but we have no choice! Whatever your plans are, I hope you take some time to enjoy yourself this weekend. Now, on to the links. Will Arizona Lead the Global Anti-Obesity Revolution? – The Globalist. Wow, this is groundbreaking stuff. Without getting into the politics of it or my own opinion (because I am not a fan of starting arguments! ), the outcome of this legislation will no doubt impact our country. So, no matter your position on government-supported healthcare, the obesity epidemic, or how to solve either, this article is worth a read to see what’s being proposed in Arizona. How to Put Perfectionism in Its Place – Bisto Katie. Hat tip to @emilylevenson for tweeting out a link to this article earlier in the week. I love it when I find a new blog, and this article is a great lesson in expectations and achievement. A lot of people at work ask me about how I find time for everything (writing two blogs, being self-employed, training for a half-ironman, cooking, cleaning, and just overall living!) and I usually tell them: “Well, first off, we don’t have kids. But secondly, I make time – I am efficient.” The second layer to that is, I accept that there are some things I just won’t be able to do. This article reminds you to “bloom where you are,” or, be your best self for the period of time in which you’re living. And for goodness sake, it’s okay to not do it all. Little by little is a great approach to healthy eating and healthy living. When Failure Isn’t – No Meat Athlete. Keeping with our inspirational theme, this is a fantastic article to hit home the “try, try, try again,” adage. I could particularly relate to this article because while I run and I run far – it doesn’t come easily and I am not at all fast at it. I am married to a man who is a former cross country runner to whom running comes naturally and he is very fast at it. He can get off the couch, run a 6 minute mile, and then go back to the couch. It drives me bonkers! I didn’t start running until I was 22, and I only did it to keep my weight in check after college. 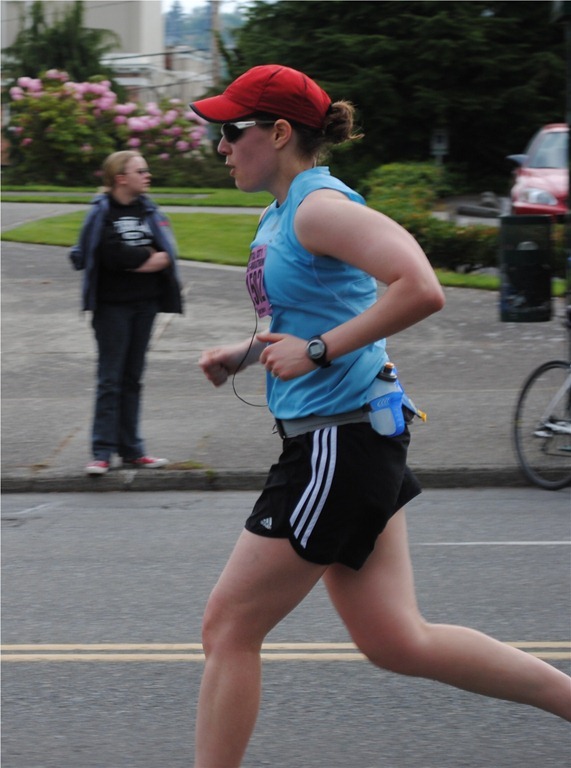 It is easy for me to get caught up in the “I am just not a fast runner,” but I have to remind myself that running is not just about being fast. Sure, I may never qualify for the Boston Marathon, but that is really unimportant in the scheme of my life. Running is self-empowerment. Running is a key segment of a sport I love. Running keeps my weight down. And, no matter the race, no matter my goal – the beautiful part is I can run. Okay, for some reason I was feeling wordy with my descriptions today, so I am going to spare you any further links! Have a wonderful weekend and I’ll catch you back here on Monday. I’m working up a recipe for a tasty treat! This week, I splurged a little bit for Test Kitchen Tuesday’s dinner but still somehow managed to come in only $1-ish over budget. And, in the process of that splurging, I realized how expensive meals with any kind of meat really are (be it fish, chicken, or beef, or whatever). We have been eating 90% meat free for about 6 months now, and, I had sort of forgotten the cost of animal products. I love Thai food. 2Chili, notsomuch. But, as we’ve discussed in the past, I’m pigheaded, and, I make what I want – within reason – especially for our test meal on Tuesdays. There are so many “not approved” foods that I would never have anything I want if I abided by all of them! This week’s Test Kitchen Tuesday comes from Healthy Appetite with Ellie Krieger on the Food Network. Ever since Lifetime stopped showing Frasier re-runs during the 6 a.m.-7 a.m. hour (my coffee/breakfast/prepare-for-the-day time), I have been watching the Food Network to start my day (like right now…) It’s kind of weird to watch shows that are usually focused on dinner during your breakfast, but, it does give me some ideas for trial dinners! I saw this on Monday morning and thought it would be a good meal to try out. This was so easy and tasty. I didn’t give it a 5 because it is different from what you’d get in a Thai restaurant, so it was not quite what I was expecting. 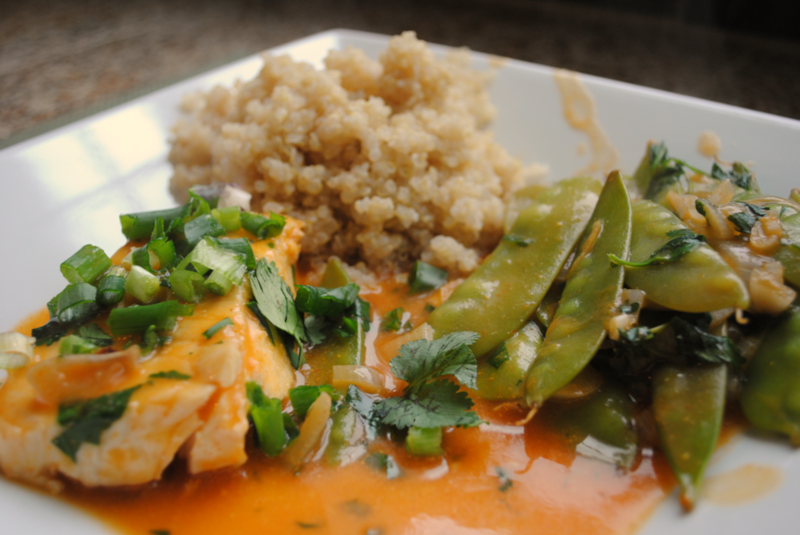 It wasn’t quite as rich as something like a red curry dish – but also doesn’t come with the same calories! I really liked the cilantro. As directed in the recipe, without the rice. 46g of protein if you go with 6 oz fillets as prescribed – that’s pretty incredible! The Verdict: In general, this was an easy and fast recipe. I think this was the best at home fish we have ever had. I couldn’t get the sauce as thick as I thought it should be, so there was a lot of sauce left over. I would probably add some diluted corn starch at the very end next time to thicken up the sauce. 2Chili said he’d eat it again without the cilantro, but we probably won’t have it too often because of the cost of fish, and, we just don’t eat “meat” products that much. But overall, we liked it!